“A.A. is not a plan for recovery that can be finished and done with. It is a way of life, and the challenge contained in its principles is great enough to keep any human being striving for as long as he lives. Idling or regressing within a retrogressive groove? Struggling with arresting an alcoholic way of thinking? Seeking a different way of living? 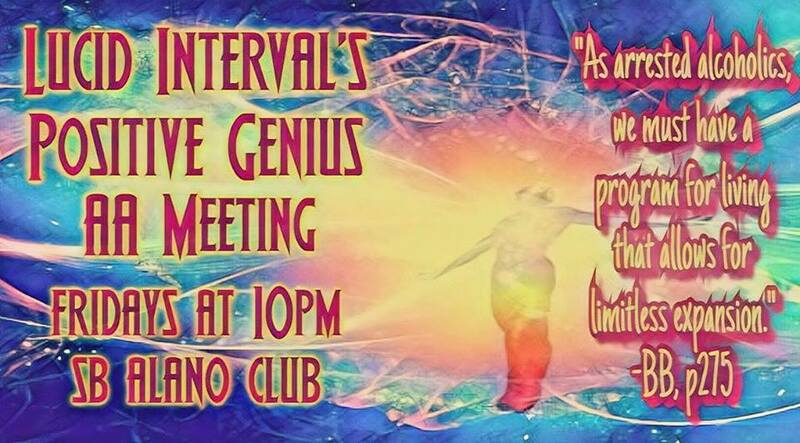 Put one foot in front of the other and walk through the door of Lucid Interval’s Positive Genius AA Meeting and get moving on your very own limitless expansion. 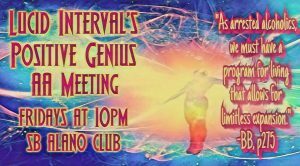 Every Friday night at 10:00 pm at the Santa Barbara Alano Club’s upstairs room.